Keeping your beer flowing, or not flowing, when needed is crucial to every brewery operation. To accomplish this, valves are used and are considered the on-off switch of a brewery. Whether your have a brew house or a home-made setup, accurate control of the flow between tanks and brewing steps ensures a high quality beer. Understanding different valves used in brewery applications and selecting the correct ones for each flow type will keep your beer clean, consistent, and of the intended flavor for the masses to enjoy. A valve is a mechanical component that controls and regulates a liquid, mixture, or gas (often called the medium) by opening, partially opening, or closing the path of the flow. The flow moves through the valve from an area of high pressure to an area of low pressure, otherwise, it is pumped through in the intended direction. Depending on the flow characteristics (medium, viscosity, temperature, etc.) certain valve types are better suited than others. The method of controlling the valve and the internal mechanical components change from one valve type to another. For example, typically a different valve would be used for regulating a gas line (needle or ball valve) versus a beer product line (butterfly valve). Figure 1: Valves used in breweries. The process of controlling a valve can be done manually or automatic, depending on the sophistication of the brewery, valve, and electronics. Typically, a craft brewery or a home-made setup will have manual valves. These are controlled by simply rotating a lever or knob from the closed (perpendicular to pipe) to open (parallel to pipe) position. Often times, there are locking mechanisms to lock the valve in the desired position. Locking mechanisms can vary, but are often either a pull handle, position handle, or a locking slide for a nut. Automatic valves are either controlled electrically or pneumatically and are often connected to a programmable logic controller (PLC). This gives the brewer full control of a brew house from a centralized location and the entire brewing process could be automated. The food and beverage processing industry divides valves into two different classifications: direct contact and service utility valves. A direct contact valve comes into direct contact with the beverage during the brewing process (an example being the racking arm). A utility service valve does not come into direct contact with the product (an example being a gas valve for a burner). Knowing the step at which a valve is implemented will help determine the type of valve, material needed, and if the valve needs to be cleaned regularly. Throughout the brewing cycle, numerous different liquids and gases are brought in and out of the tanks. Depending on the step and the design of the brewery equipment, different valves are used to correctly and safely move the flow. 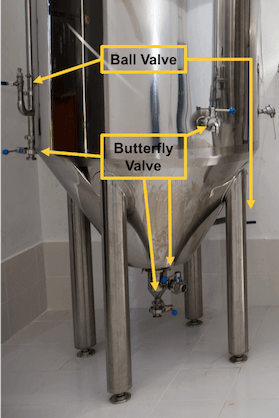 Typically, throughout a brewery’s equipment you will find a mix of butterfly, ball, globe, gate, check, needle, diaphragm, and solenoid valves. Each valve has their own advantages and disadvantages for different mediums. Ball When the valve handle is rotated, it rotates a rotary ball (with a bore) to open/close the valve. Unobstructed flow, low pressure drop, good seal, and durable Possible hygienic issues due to the floating ball Gas lines, carbonation stone, water line, or for thicker mediums (wort). Butterfly When the valve handle is rotated, internally a stem rotates the disc, or wafer, from the closed to open position. Good hygienic design, good sealing properties, and easily cleaned Not suited for high pressure and has an obstructed flow due to the stem Clean-in-place (CIP) line, blow off arm, racking arm, and bottom blow out of a tank. Globe When the knob is screwed it moves the stem and plunger up/down to open/close it. Good flow regulating properties High pressure drop due to flow path Often used on a water inlet/outlet or mixing. Gate When the knob is screwed it moves a gate, or wedge, up/down perpendicular to the pipe to open/close it. Easy to operate and unobstructed flow Hard to regulate flow and not meant for high pressure applications Often used on a water inlet/outlet. Normally Closed Solenoid An electric coil creates an electromagnetic field that forces the plunger up to open the flow path. When electricity is cut, a spring forces the plunger closed. Quick response time, reliable, and normally closed for safety reasons. Not good for contaminated or highly viscous flows Automated bottling process or for gas/glycol lines for safety reasons. Needle When the handle is screwed, a needle point plunger moves up/down to control the flow. Precise control of the flow and a high max pressure drop. Possible hygienic issues due to internal threads Gas lines and water lines to obtain strike temperature. Diaphragm When the knob is screwed, it moves the stem and diaphragm down to steal it against the valve body. Good flow control and is a hygienic solution. 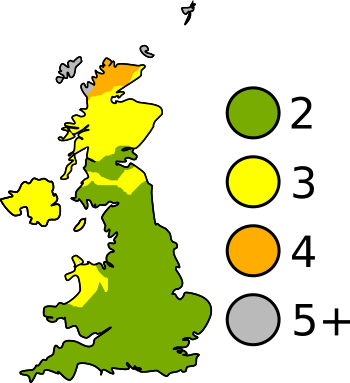 High pressure drop due to flow path Often used on heat exchangers. Besides ensuring you are using the correct type of valve, numerous design considerations for that valve need to be taken into account due to them being used in a brewery for often times hot contaminated lines. The valve housing is generally stainless steel as it won't deteriorate at high temperature, can withstand harsh cleaning agents, is durable, and won't leave a metallic taste int he end product. For water lines or a cooling circuit, a brass housing is also suitable. The valve seal is typically EPDM (ethylene propylene diene monomer) as it can withstand temperatures up to 130°C, but for higher temperatures PTFE (teflon) is recommended. The three main valve connections are threaded, flange, and tri-clamp. A threaded connection will be the most common, but is typically not preferred from a hygienic design perspective on a line with perishable fluids as the threads can become dirty and the valve is not easily removed from the line. A bolted flange connection is a cleaner connection as there are no threads, but the disassembly process is time consuming. For a line that needs frequent cleaning, often times a tri-clamp connection is used. This allows for a good seal between the connections while allowing for a quick disassembly to clean the valve. To ensure your end product is as desired, all components coming into contact with the product need to be cleaned frequently to prevent a buildup of contaminants. Threads, turns in the valves, gaskets, valve stems, and floating balls can all house contaminants that would affect the end product. Ensuring your valves are easily disassembled form the line, can be fully taken apart themselves, and cleaned properly will ensure the end product is as advertised. 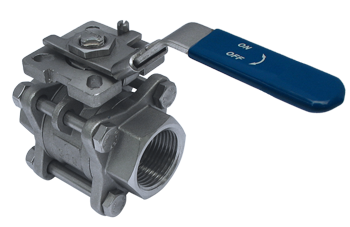 For example, Figure 2 shows a 3-piece ball valve to allow for proper disassembly and cleaning.